6 Feb 2005 @ 14:58 by jmarc : snort. 7 Feb 2005 @ 17:43 by hgoodgame : jmarc! You just made my day!! That was a great link. 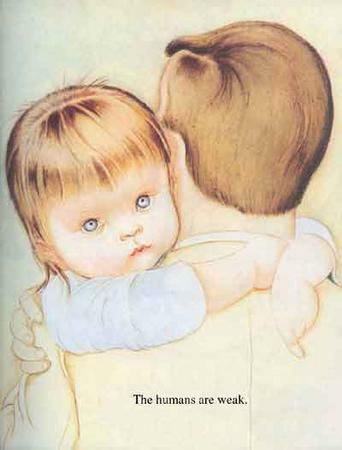 BTW, I have that book, a gift from my former mother-in-law, the sweetest person I've ever had to honor to meet and share hearts with, and the children to me look not so much psychotic but totally trusting that the father's strong arms will carry and protect. It's when that look disappears, we've left the cake out in the rain again. 7 Feb 2005 @ 17:56 by ming : Not so much? That's quite a huge difference there. Obviously there are different perspectives. Personally, if anybody looks at me like that, I'd be really worried, and start grabbing for something to defend myself with, and I'd back out of the room slowly and carefully. If one of my kids were born looking like that, I'd be very, very worried. is Bob kidding? Because it really seems like it is about that, in a round about way. Still funny though.